The Asian tiger and its 27 million inhabitants thrive on many natural resources but also the development of semiconductors. Malaysia is even the only country in South-Eastern Asia with its own brand of car, Proton. Tourism development is more recent, at least on international tourism. The tourist infrastructure and transport are those of a developed country. Unavoidable, the capital Kuala Lumpur and its 1, 5 million inhabitants, 4 million if one includes the urban area. You will probably arrive via Klia, its airport. The city is the symbol of Malaysia's economic success. Among the symbols, we find the Malaysian Grand Prix Formula 1 and the Petronas Twin Towers, whose reputation has toured the world, notably thanks to the movie High-Vaulting with Sean Connery and Catherine Zeta-Jones. The city was founded in the nineteenth century following the discovery of deposits of tin. Kuala Lumpur is an ultra-modern city that has nothing to envy our European capitals. Latest event, the creation of a tennis tournament listed on the ATP. Malaysia's fight against deforestation and no fewer than 20 national parks and dozens of protected reserves. They include some of the most famous parks located on the continent and north-east of the island of Borneo in Sabah Province: Taman Negara, Taman Negara Pulau Pinang, Tasek Bera, Kinabalu, Crocker Range, Bako - Kuching, Cameron Highlands National Park Batang Ai, Penang ... There are also marine parks, marine parks include Pulau Redang and Pulau Tioman. They contain all the treasures and sometimes endemic, you need a ride in the forest if you go by Malaysia. 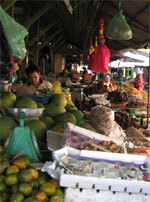 Side climate and weather, Malaysia is hot, between 26 and 28 ° C throughout the year. It is humid, with rainfall of about 2500 mm per year and see the mountains. The country is divided between mainland Malaysia, the most heavily populated with 80% of people in southern Thailand border and southwest of Singapore. It culminates at 2189 meters at Mount Tahan. East Malaysia located on it on the island of Borneo, which it shares with Indonesia and Brunei. Malaysia Eastern culminates in its north-east to Mount Kinabalu, 4 095 meters. A curiosity for us Europeans, the sepak takraw. This sport is a kind of soccer-volleyball, and playing three against three. It is the national sport. The dominoes are also highly appreciated by the people! Add to bookmark this page Malaysia " Trip Malaisie " - Firefox do "Ctrl D"